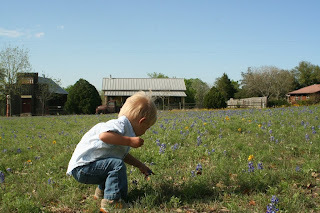 The Texas wildflowers are in full bloom right now and we hadn't ventured out to see them yet. Rumor has it they aren't going to last much longer so I thought I'd better take advantage of the overcast afternoon - thinking great natural lighting for outdoor photos. It wasn't until I was aimlessly looking for a private field of wildflowers where the kids could safely play and pose for photos, that it occurred to me that I might get lost. I had no map, no GPS, and four toddlers in my car which meant no stopping and running in somewhere to ask directions. Chris is not available for the "can you mapquest something for me and tell me if I'm going the right way?" type of calls at work, so I started to pray. It was something like, "Okay God, sorry I didn't really prepare here, could really use your help". I decided on trying to locate the field we'd found with my parents last year. I traced our drive from a year ago, praying continuously, "Lord, please tell me if I need to turn." Nothing was looking familiar, nothing felt right until I needed to turn and then, suddenly I'd remember. Then another straight away and I'd doubt some more, but yet again, a turn I needed to make would come up and again I knew I was back on track. We got to the field and man, what a disappointment. I had passed a dozen or more fields that were far brighter, prettier than this one right off the highway. But the kids were sick of being in the car so I parked next to the sparsely-flowered field and decided we'd picnic under a tree and plan to find another photo-op with a map and Daddy on another day. Still, it turned out to be a perfect afternoon. 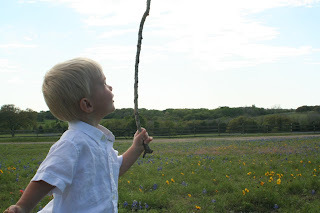 The boys were so excited about all of the abundance of sticks that they barely noticed the lack of flowers while Sophia loved every flower she could find and simply running up and down the hill. I enjoyed the safety the spot allowed and the shade under the sprawling oak trees was pretty nice too since the sun decided to poke out after all. All said and done, I couldn't help but ask myself if I truly am trusting God to direct my path. Am I leaning on my own understanding too often? Not allowing things into my life that might look like a bust yet be just the place God needs me to be? I'd like to think he'll direct my path in spite of my strong will to be in control - it'd just be a lot easier if I'd trust him the whole way. "Awe shucks, picking just one bunch won't hurt..."
"Look, Mom, I can touch the sky!" "I think I found one of those flowers you were hyping up the whole way here!" "Blue skies, bluebonnets and the wind in my hair - doesn't get much better than this!" "All said and done, I couldn't help but ask myself if I truly am trusting God to direct my path. Am I leaning on my own understanding too often? Not allowing things into my life that might look like a bust yet be just the place God needs me to be?" Today I was reminding myself that when God gives me a task that frightens me, its my responsibility to jump at it. Where God guides, He will provide, when I faithfully do my part, He will do His. Reading this post just confirmed for me that God has been quite busy, while I am dragging my feet. And I get to see beautiful pictures of the kiddos at play. (And we know I have no faith in maps, GPS, mapquest, expedia-just turn left) Love to all-see you soon. You post the most lovely thoughts that just "hit home" with me. God sure provided you with a beautiful backdrop for those pictures, and he also provided your beautiful kids with an awesome Mom. HE knows what he's doing! God Bless you! You have an awesome family. 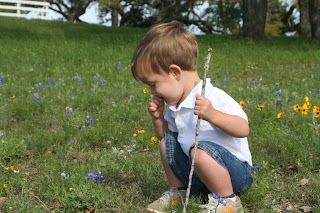 Bluebonnets or not, those are some really cute pictures!!! We just took some pics last week too! We drove all over the place loking for some! We finally found 2 big fields and they were beautiful!! AWESOME POST!!!! We all need a reminder every now and then of who is the Ultimate Controller! Thanks! I needed to hear that. I miss you so much. 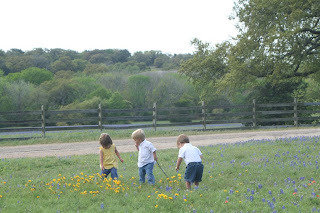 We are going to TRY and get pics of the boys tomorrow in some bluebonnets... hopefully we'll find somewhere nice to take some pics. 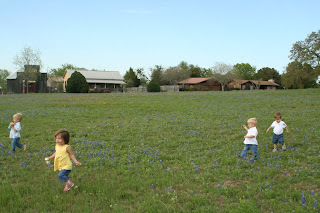 Love the field of blue flowers and your little ones running about ! Please pray for this young Christian mother struggling with a painful and difficult medical decision for her unborn daughter. Thanks for the scripture Mari...so very true!!! I Love you! Yet another beautifully written, well thought out and meaningful gem of a post, Mari. I love reading your thoughts and perspective on life. Your soul is the most beautiful one in the garden. Also, your 4 wild flowers are growing more like weeds these days! I can't believe how grown up they look. Have fun looking for another field to play in and take pictures of the kids running free! 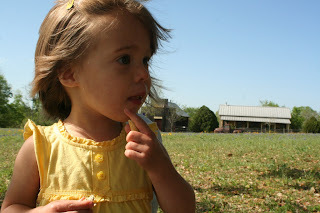 I got to your blog from Steece's Pieces. And I had to comment. 2 weekends ago, I spent the weekend, in TX: College Station and Austin to be exact. On the drive from Austin to College Station my cousin(who I was there visiting) and I stopped and got pictures of the bluebonnets. The next day we drove from College Station to Plantersville to go to King's Orchard and pick some fresh strawberries! I thought it was such a coincidence that I had to leave a a comment.